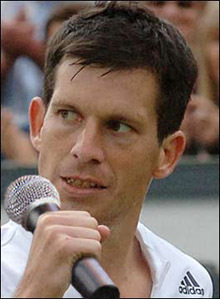 Tim Henman says ‘No’ to Britain’s Davis Cup captaincy. Tim Henman has ruled himself out of the running to be Great Britain’s next Davis Cup captain because “it doesn’t feel like the right time”. Incumbent John Lloyd is considering his future in the role after becoming the first GB captain to oversee five successive defeats when his side lost to Lithuania last weekend. That defeat has left Great Britain on the verge of dropping into Europe/Africa Zone Group III, the lowest tier of the competition, and prompted calls for change within the team. Henman, however, has ruled himself out of taking on the captain’s role, although the 35-year-old admitted he would one day like to lead his country. “Maybe in three years or in 13 years, sometime in the future, I might be interested in being the Davis Cup captain,” the former world number four told the Daily Telegraph. “But it doesn’t feel like the right time. I’m enjoying my family and my golf – and not having any structure in my life. “For 28 of the first 33 years of my life tennis was what I did. I wouldn’t change that and I’m sure at some stage I’m going to get more involved and give back to British tennis.